The All New, All Daring Delusional Honesty! 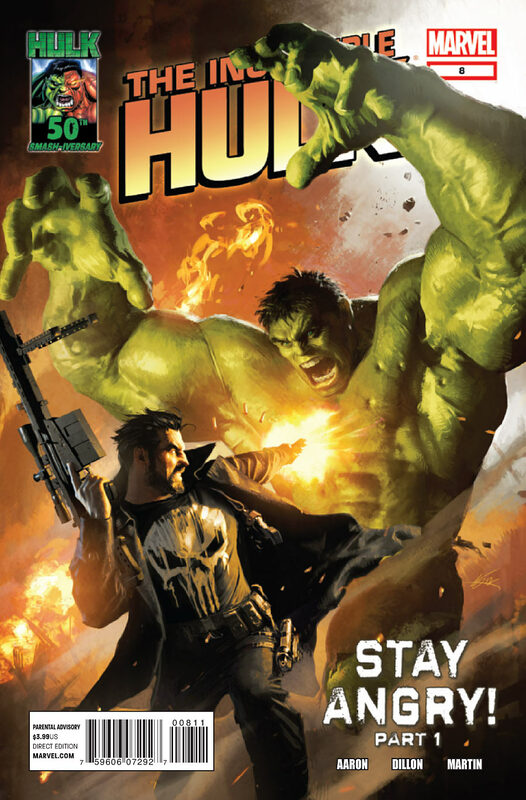 : Stay Angry: Or, How Marvel Must Want Me Behaving When Reading "Incredible Hulk"
I just picked up issue 7 this week, having fallen behind, and have finally decided that, yes, now is the time to jump ship. I gave Aaron a lot of slack, but at this point I can tell the Hulk stories he wants to tell are not the ones I want to read. And that's fine. There may be others who enjoy what he's doing, but for me, there are too many other things I'm reading and enjoying more to warrant picking this up further. I'm not angry about it, and I'm sure another writer down the road will tell Hulk stories I want to read. But for now, I'm out. Just adopt my zen philosophy, Gary. It's all good. Didn't they do this back in the 90's when Hulk would turn back into Banner but he'd act like the Savage Hulk or something? Like comparing apples and oranges, Kazekage--the Savage Hulk is not, nor has he ever been malevolent. Banner, on the other hand, is, according to Aaron. He gave himself an "out," so I hope to God he uses it. Unfortunately, "Stay Angry" is so far removed from what makes the characters of Banner & Hulk unique that the whole scenario's interminably hard to digest. I now see what Iron Man fans disliked over so many years. Marvel's doing it to my favorite character now. That's . . yeah, I can see that that explains everything in a way that totally . . .doesn't. You do know that this means Teen Hulk is just around the corner, now? It's really hard for me to be overly critical with the turn that old jade jaws' book has taken lately. After all, I'm sure a lot of greenskin's loyal readers jumped ship when Hulk went gray back in #324, and stayed gray. What I can say with certainty, however, is twofold. First, I have never enjoyed Jason Aaron's work. It's not like one of these situations where the first time I see a writer, and I don't care for the story, I decide to not ever like anything he does EVER. No, I read his Ghost Rider and I read his Wolverine, giving both fair shots to hook me. They failed. I don't know what the future holds for the jolly giant, but as long as Aaron's behind it, I'm now sure that I won't like it. Second, I haven't really cared for The Hulk's last few stories, even when Pak was wrapping up his run. Now, I'm not sure how much input he had in the decision, but the addition of more Hulks to the mix rubbed me the wrong way from the start. Most superheroes don't get "super" by any means other than a costume change, but Banner changed into a large, angry, green powerhouse who had a much different outlook on the world than his milksop counterpart. He has always been unique ... and special in this way. The inclusion of more Hulks takes away from the Hulk's uniqueness. Also, you have the personality issue. Red She-Hulk, Red Hulk and Samson all display meaner traits, even second personalities, in their "Hulked out" state, which implies that gamma radiation provides super power along with split personas. Again, this takes away what makes the Hulk special. His creation never came from the gamma bomb; it was only the bomb that unleashed Banner's hidden rage and gave it shape...and an outlet. If he never possessed such rage pent up inside from his experiences growing up, he would've just turned into a super-powered person and remained in that form full-time (like Leader, Abomination and Half-Life, none of which had split personas from their gamma exposure). So, now we have other Hulks running around and ol' greenskin is just another of a long line of super-powered joes running around the Marvel U. Last point: I read the latest trade of New Avengers today, in which Skaar plays a significant role. I think Bendis forgot that he is just a "tween" who transforms into a Hulk. While he came from a pretty rough upbringing, I think the adult situations and innuendos in this story are very inappropriate for this young character. Rick, it's always wonderful to hear from you here. While I enjoyed Jason Aaron's Ghost Rider stories, his Wolverine never did anything for me--and the Gray Hulk's appearance in that series didn't rub me the right way at all. You and I will have to agree to disagree about the rash of Hulks. While I may agree there are too many gamma-irradiated characters as result of Jeph Loeb's tenure, I've got to say, having been in full Hulk research mode for the better part of a year, that I'm a few steps ahead of you. There's an essay in my upcoming book, called "The Day the Earth Turned Green," that goes into detail about all the gamma-irradiated characters who've cropped up throughout the Marvel Universe. I think the piece will be surprising to you, particularly because of your affection for Bill Mantlo's run, which actually provides a sound basis for my theories in it. I find it hilarious that there are Hulk fans out there who dismiss our concerns about Aaron's tenure on the basis that Greenskin is a character conducive to these kinds of changes, and is infinitely adaptable. Virtually all of the changes to the character that occurred since Al Milgrom and Bob Harras turned him gray in #324 have had some precedent in the series' previous storylines. This isn't remotely true with Aaron's "Hulk Vs. Banner" and associated arcs. There's a distinct difference between the Hulk being a misunderstood monster who sees Banner as his jailer, and the Hulk justly hating Banner for being a vicious psychopath who gets perverse thrills out of sticking him in crazy situations. I couldn't agree with you more, Gary. I despise Jason Aaron and what he's done to my favorite character. I even wrote what I felt about his abominable treatment of Hulk/Banner on his blog. Someone had to do it, might as well be me. Don't care if he likes it or not. I'm hoping after "Stay Angry" that Jason Aaron leaves. I never thought I would despise as much as Bruce Jones and his run. I was wrong. Jason Aaron is right on his level of aweful. I would take Pak or David back in a heartbeat. 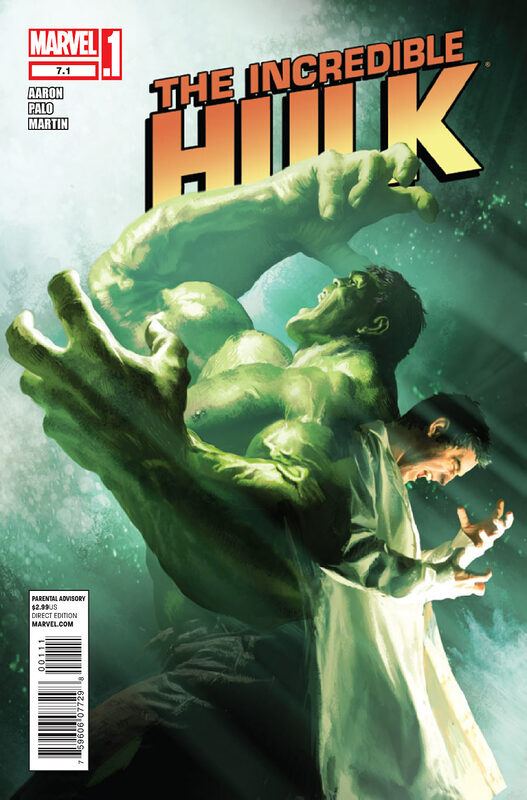 I think Bendis or Fraction would be an improvement as writer for Incredible Hulk! I can't believe there's people who actually like this horrific run and supporting Jason Aaron... even so-called Hulk fans on Marvel.com (Yeah, I'm looking at you, GammaCosmic)! I don't think even Jeph Loeb was this bad, do you? And to be honest, I'm glad that there's others Hulks around like Skaar, A-Bomb, She-Hulk, Red She-Hulk, Lyra and Red Hulk. They're all different and unique in their own ways, so it's not like their stealing the spotlight from the original Jade Giant. I just hope Marvel comes to realize how terribly bad Jason Aaron is and get a great writer that understands Hulk and Banner in an sense that Pak or David did. Personally, I wonder how good JMS or Kieron Gillen or Jeff Parker would be for the Green Goliath. At least Red Hulk's book is good, thanks to Parker. Speaking of which, what are your thoughts of Jeff Parker working with Skaar on his Thunderbolts/Dark Avengers? Let's just hope for the best in the future. At least, film and television wise, Hulk is doing great. We've had a great adaptation of the character in "Marvel's The Avengers", another decent adaptation of Hulk in "Avengers: Earth's Mightiest Heroes", and we'll be getting the new series "Hulk: Agents of SMASH" with Hulk, Skaar, She-Hulk, A-Bomb and Red Hulk!!! By the way, I can't wait till you finish your book. This is one fan who'll definitely purchase a copy. Anyways, I wish you the best, my friend and fellow Hulk fanatic! Have you heard that "Avengers: Earth's Mightiest Heroes" is getting canceled at Loeb's suggestion and re-booted to fit in with Ultimate Spider-Man? That's the story I heard, anyway. I can understand why a writer would want to take things in a "new" direction, but what Aaron has done is to literally remove the entire history of the charcter he's writing with no regard for anything that has ever happened before. This isn't a re-boot of "The Incredible Hulk". It's an entirely new character that is somehow riding the coat-tails of the very same "Hulk" that Aaron has shown no regard for. In spite of all that Aaron wishes to accomplish, the Hulk, and Banner have a history. They have established personalities and circumstances. To suddenly turn Banner into a sociopath and re-create the Hulk as the nobler of the two is to discard nearly five decades of history, and the personalities that have been developed over time. When Betty Ross claims that this is what Banner always was in her eyes, he leaves gaping plot-holes that have existed since the inception of the character. Aaron is essentially claiming that the child-like Hulk of the 70s-80s was somehow keeping a sociopath in check. He is also claiming that the brilliant and highly sympathetic milk-sop scientist that made one noble sacrifice after another was really a small-minded psychotic. As various writers came and went, all the "new directions" at least made some vague attempts to reconcile those various directions with what had come before. Prior to this fiasco, Greg Pak even managed to string it together with Banner taking a more pro-active role, being heroic even without the help of his big green alter-ego. The two characters (or two aspects of the same person) even operated with shared goals, and if it was not in "harmony", at least there was some semblance of finally managing to NOT be at constant odds. Now, Jason Aaron has simply discarded all the work that came before his own. Instead of re-inventing the character(s) and their conflicts, he's simply spit upon all the work done in these past few decades, and shows absolutely no regard for the characters essential to this comic book. If Marvel is willing to put up with this nonsense, they have the right to publish it. However, since I am not willing to put up with anymore of Aaron's deliberate desecration of Banner/Hulk, I'll simply stop reading. It isn't fun or interesting when an author has no regard or respect for the characters he works with. Aaron obviously wanted to create something that was completely disconnected to any other character in the known Marvel Universe, and should have done so without trying to ride the coat-tails of one of Marvel's cornerstone characters. Unfortunately, he's done his "work" at Hulk/Banner/Betty etc's collective expense. He's treated them as poorly as he has his intended audience, but fortunately for us, WE can walk away. I agree with everything you wrote. Aaron took everything about the Hulk: his history, relationship with others and just piss them away and created a horrible series. I am also disappointed with the current direction of this comic book. I don't understand why the Red Hulk gets the amazing artist/writer while we are getting stuck with this stuff. I just happen to be re-reading those early Peter David / Todd McFarlane stories. The story / The art, very difficult to compare with this current run. However, As a collector of the hulk for the past 20 years, I'll keep on collecting the book. I will always collect this book. But I'm not exactly looking forward month to month. I'll collect, read, and put it directly in the 'big white box'. It will not sit on my night stand for months, being re-read over and over trying to figure out what's coming next. Completely being emerged in the great art. There will be no sad gut wrenching moment like at the end of Planet Hulk when it was all taken away from HIM. 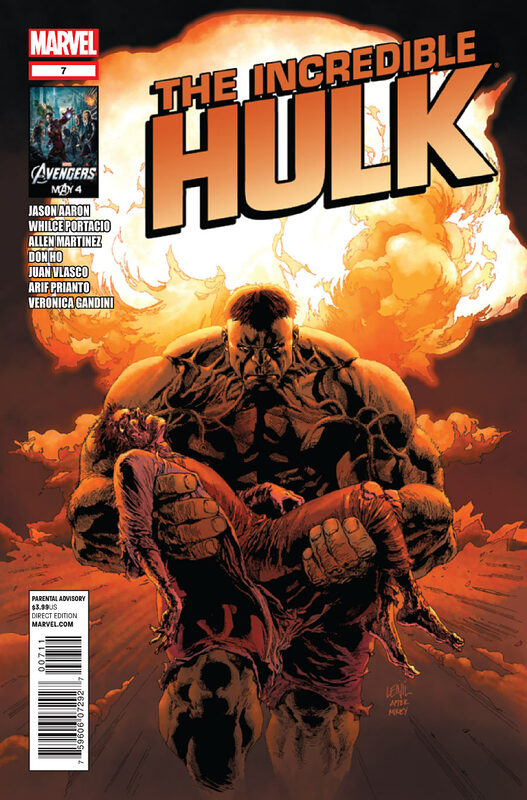 Or the amazing moment when the Grey Hulk took Betty for some air and revealed her pregnancy. Or the moment when the hulk stands over his boy Scar, and he turns back into Banner and they hug on the last page. Amazing! Nope! Just will drop these guys directly into the big white box. Im off the Hulk Series until Marvel decide to relieve Jason Aaron from writing responsibilities.Thanks for dragging the series into the gutter Aaron,Bravo. Hmmmmm I wonder what Rulk is doing over on AvX??? ?